The Richard Lancelyn Green Collection is an extraordinary collection of Conan Doyle and Holmes related material housed in the Portsmouth City Museum. This collection of over 16,000 items was bequeathed to the City of Portmouth on Richard’s death. Richard was the world’s foremost experts on Conan Doyle. He amassed this collection over 40 years and the items filled 11 vans! With this number of items, cataloguing the collection has been a mammoth task and only a small proportion of the items are on display at any one time. The current exhibition is A Study in Sherlock: Uncovering the Arthur Conan Doyle Collection. This showcases many more of the fantastic items including unique photographs, production posters and letters from the influential and the famous of Victorian and Edwardian society. The exhibition’s displays explore the life of Arthur Conan Doyle and the creation of Sherlock Holmes. It features a range of interactive displays, a ‘new’ Sherlock Holmes mystery, and narration by Stephen Fry, the Patron of the collection. If you are in the area it is worth visiting Bush Villas where Arthur Conan Doyle began his professional career as a GP in the summer of 1882. He had arrived in Portsmouth in the June of that year, from Plymouth, with no job, nowhere to live and little more than £10 to his name. It is from here that he arranged for the publication of the first two Sherlock Holmes novels, A Study in Scarlet and The Sign of Four. Portsmouth was, in this sense, the birthplace of the Great Detective. Ric hard Lancelyn Green was born in 1953 and died in tragic circumstances in 2004. In To Keep the Memory Green, reflections on his life, edited by Steve Rothman and Nicholas Utechin, the bibliography of his work covers 30 books by or edited by him, 56 contributions to books, 55 contributions to periodicals, 33 Christmas cards and postcards, 26 articles about him, 4 books dedicated to him and 4 television appearances. His own books included The Further Adventures of Sherlock Holmes, a collection of stories written to reflect and enhance Holmes great achievements. Conan Doyle was always trying to persuade me to release further stories but others soon began to fill the public’s desire for more stories about the Great Detective. This book contains eleven stories, at least one of which I have mentioned amongst the cases that for various reasons I have not felt able to publish. He also published a collection of parodies, plays, poems and speeches that really extend the Canon by pulling together all Conan Doyle’s other writings related to Sherlock Holmes. The Uncollected Sherlock Holmes includes the original prefaces some of the collections including the one I wrote to His Last Bow. Year in and year out, letters flood into our address in Baker Street and for a while the nearby Abbey National Building Society used to respond to some of these letters whilst we were away. In 1985 Richard published a selection of the most interesting and entertaining of these letters in Letters to Sherlock Holmes. 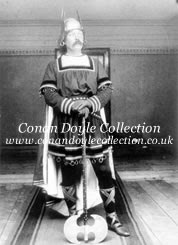 When Richard died he bequeathed his collection of Sir Arthur Conan Doyle and Sherlock Holmes memorabilia to the City of Portsmouth because he was helped by the staff at the City’s Central Library when he was researching Conan Doyle. He had plans to produce a definitive three-volume biography of Sir Arthur which of course remains unfinished.